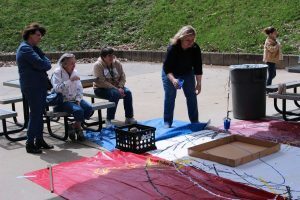 Moundsville Middle School Art teacher Joy VanScyoc demonstrates the technique used to create the artwork featured in the “Pendulum Painting” exhibit. 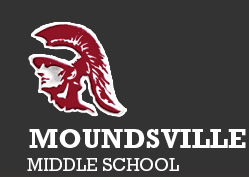 Students at Moundsville Middle School learned about the forces of motion and gravity using a new painting technique called pendulum painting. Instead of using the traditional method of a brush, students attached rope to the ceiling of their classroom. They mounted a cup filled with acrylic paint at the end of the rope. By using this fixed object, otherwise known as the pendulum, students discussed how the rope moves due to the force of gravity. Similar to a swing moving back and forth, this method demonstrates the physics of the pendulum, while the image produced shows its movements. Works by the following students are on exhibit at the Grave Creek Mound Archaeological Complex in Moundsville: Elise Martinez-Cunningham, Ethan Neely, Kobe Yocum, Reese Bortle, Austin Heath, Jackson Thomas, Samara Walker, Travis Huff, Carl Cochran, Hayden Shields, Kaden Shriner, Kelsey Kidd, Tony Roth, Isaac Trayon, Dean Gibson and Alex Francis. The public is invited to view the student art display from 9:00 a.m. to 5:00 p.m. Tuesday through Saturday at the Delf Norona Museum until Saturday, May 12, 2018.